They’re from communities that coexist and but do not respect or trust one another, and as the story develops it becomes apparent that their whole world might be at risk for the want of a little honesty and co-operation between the two groups. Fawn and Dag are a microcosm of what could be, but they meet entrenched resistance, ignorance and bigotry on every step of their journey together. As it becomes increasingly clear that they will never be accepted within the narrow boundaries of either community, they make a new life for themselves, leaving a trail of positive change in their wake. Of the very many things I love about these books, I’ll single out two things. The first is that the heroine’s superpower is common sense. She’s not even book-learned, though she can read and write and keep accounts. She’s smart, logical and saves the day more than once by sheer force of deduction, though her efforts are usually dismissed by everyone except Dag. The second is that without ever resorting to theme-mongering, the Sharing Knife tetralogy champions not waiting for people in leadership positions to make necessary change. The books are about making an effort, doing whatever you can to make a difference at grass roots level, and never giving up. I love that. The Sharing Knife books offer an enjoyable read, a satisfying ending, and rich, chewy food for thought. What’s not to like? If you’ve read these books did you enjoy them? Which elements of the story hit your personal id list? If you haven’t read them, are you tempted? If not, why not? This entry was posted in Favorite Books, Heroes, heroines, reading recommendations, Story Telling and tagged Bujold Goodreads blog, eight ladies writing, good books, Jilly Wood, Knife Children, Lois McMaster Bujold, sharing knife series. Bookmark the permalink. 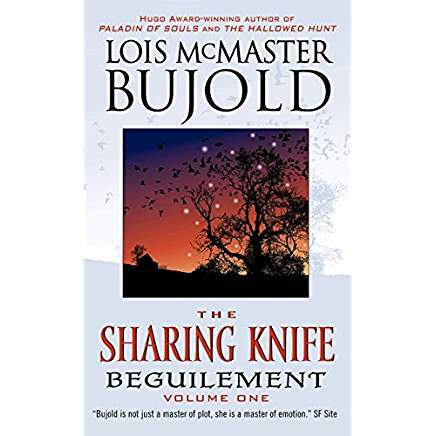 I have read the Sharing Knife series many times, at least every other year. It is so great and, yes, I think it is so for just the reasons you listed. PS How’s your writing going? I do not know how well-known Lois McMaster Bujold’s books are generally here in Sweden, but they are in any case sold (in English, they are not translated) in Sweden’s largest bookstore for Sciens fiction and fantasy. I started reading her Vorkosigan series about fifteen years ago, among my attempts to improve my English by reading at least one book a month in English. I have now read all but the latest and I have also read some of her fantasy, including the Sharing Knife series. As for my writing, it went really well in December and over Christmas and New Year and I managed to break through a long-lasting blockade that has been a big obstacle in the tenth chapter of the new beginning I write to my WIP. Since then, however, it has slowed down. Right now I am reading through a lot of old texts to see which direction the story must take now, if I want it to have the end that I aim at. Oh, good. Something else for my huge TBR pile. I must put these on my TBR pile! However, what with one thing and another, right now I’m binge reading Carl Hiassen. I love Skink. Maybe you should start with the new novelette, which is apparently about 50k. Then you can decide whether to go back and read the other four books. LOL, saying these books are “not as loved” as, say, the Vorkosigan saga, is perhaps true. But it’s like saying vanilla is not as loved as chocolate. Any Bujold is damn good reading! In the Vorkosigan series, the forward momentum is often provided by the main character, Miles. He abhors a boring situation, and his curiosity can provoke the whole plot of a book, or drive it on from an assigned beginning. Fawn and Dag also have the extreme curiosity, and it’s very interesting and a delight. But in their case, the plot is provoked by . . . well, the malices (the one-damn-thing-after-another mindless plague of the series). I have a feeling these characters would be much happier without dealing with these situations (which is a very smart way to feel, actually). I can’t wait to see the new Novella, and see this universe from the angle of different characters — I bet we get to see Dag and Fawn through the other characters’ eyes, too, which is always a hoot! I carefully said I thought these books are less well-known. My impression is that more readers are familiar with the Vorkosigan universe than the fantasy worlds. I much prefer horses-n-swords to spaceships, genetic engineering and whatnot so I’ve never got to grips with Miles, much as I’m fascinated by the idea of him. I’m also really looking forward to the novella. One of the many things I really enjoyed about the original books is Barr’s arc–the way he turns from being an obnoxious blight on the community to a cornerstone without ever losing his smarts or sense of mischief. By the end of the series he was one of my favorite characters. Now one of his early misdeeds is coming home to roost and I can’t wait to see how he handles it.